Do You Know a “Naughty” Dog? … The list is long and I’m sure you might even be able to add to it, if you know a dog in need of improved manners! Dog and puppy manners are a fundamental aspect of companion animal training. Rude Rovers may find themselves taking a one-way ride to the local animal shelter if they fail to learn self-control. 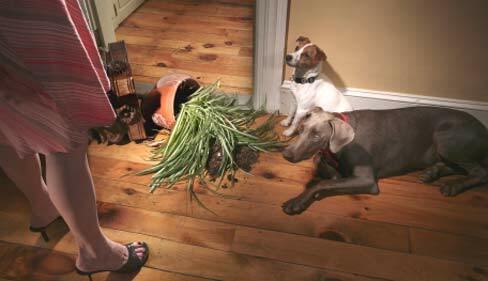 The shame of it is, no matter how naughty the dog, the dog can’t be blamed. Even more disconcerting: virtually every dog surrendered because of problem behavior could have been quickly and humanely improved. All it takes is the right dog behavioral modification methods and willing human teachers. Dog manners and impulse control are learned–or not! Without proper instruction dogs will be dogs, behaving in ways people may find off-putting. However, from the dog’s perspective, every action is a means to an end, or she wouldn’t waste the energy. When dogs repeat misbehaviors, it is because reinforcement– desired results– occurs as the direct result of those actions. Training for improved dog manners starts with people training. Learning how to reinforce desired actions and how to humanely extinguish inappropriate, dangerous, and antisocial dog behavior is one of the most rewarding aspects of training for both pets and their people. When behavior modification is done correctly, dogs never need to be told “no”; instead they are taught to make different choices that result in them not starting to misbehave in the first place. Which would you prefer: a dog that stops misbehaving in response to interrupting commands, such as “Leave it!” and “Off!”, or a dog that doesn’t take things or jump up unless given permission? Putting an end to family members’ scolding, frustration, and anger by increasing a dog’s cooperation and self-control is the best aspect of dog training I offer. These are just a few examples of some of students’ dogs getting some “dog improvement!” If you are interested in learning how to improve your puppy or dog’s manners and self-control, sign-up for one of my dog training classes or for a private consultation.